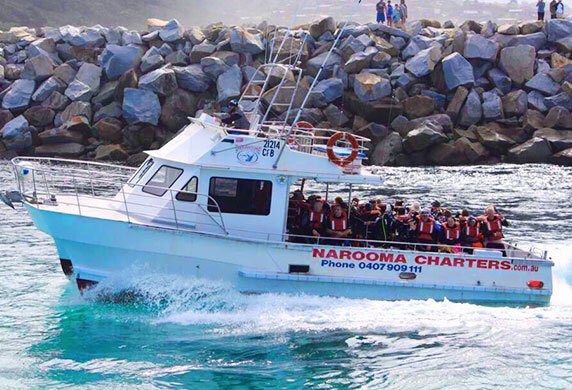 Narooma Charters is the most experienced local crew and the largest and safest vessels. 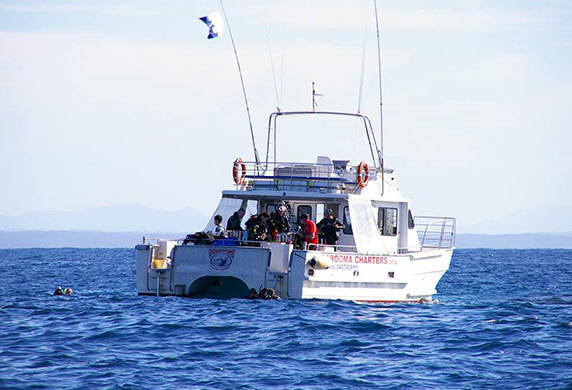 We conduct tours to Montague Island, Penguin Tours (in season), Whale Watching(in season), Diving and Snorkelling with the Seals and fishing Charters. Our vessels are in the highest safety category of 1c which is classified passenger ferry class. 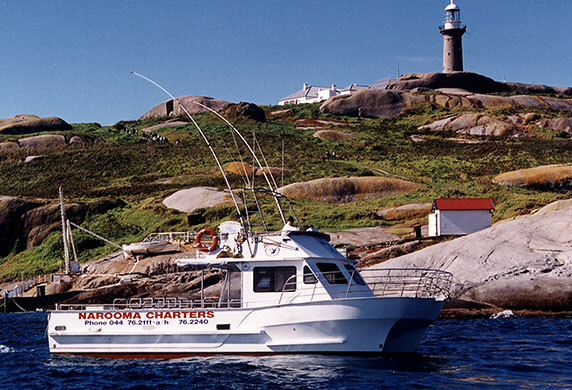 We have been operating since 1983 and are the only company conducting tours to Montague Island since 1991. After we test drove Dreamtime our comment was ‘awesome’ and we placed the order that day for our new vessel. When we had Dreamtime built we went looking for the perfect boat. The wish list included a smooth ride, plenty of power and speed, good stability and plenty of room on board. The answer came when we went for a test drive in a Nustar Cat with a beam of 5 metres and a speed of 26 knots. The boat handles superbly, even in choppy conditions, with very little roll and next to no hull slamming which you get on a similar sized single hull at the same speed. The amount of room on the boat is incredible, and the ability to stand on the bow and watch dolphins swim through the tunnel makes Dreamtime one of the best charter boats in Australia. Sea Eagle is a 12.5 metre Stebercraft with a forward cabin, giving maximum space at the rear for passengers. 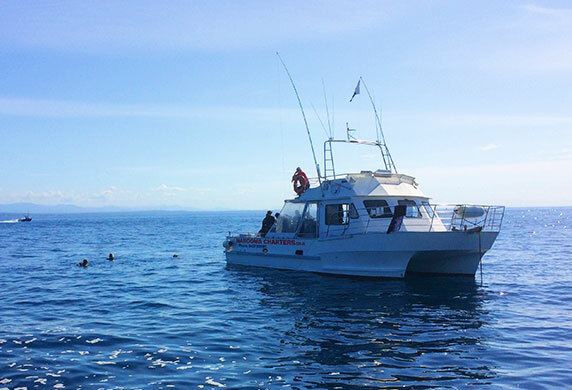 Sea Eagle was built for Narooma Charters and has been maintained to the very highest standards, with new motors installed in 1997 and full rebuilds in 2008. She gives a smooth, comfortable ride and has a good reputation for reliability and seaworthiness. Several changes have been incorporated into Sea Eagle to suit the Narooma area, including special spray chines to give a dry and comfortable ride. The boat is equipped with full safety gear for all passengers and crew. The latest in electronics incl GPS, Sounder plus all survey and safety equipment. © 2018. 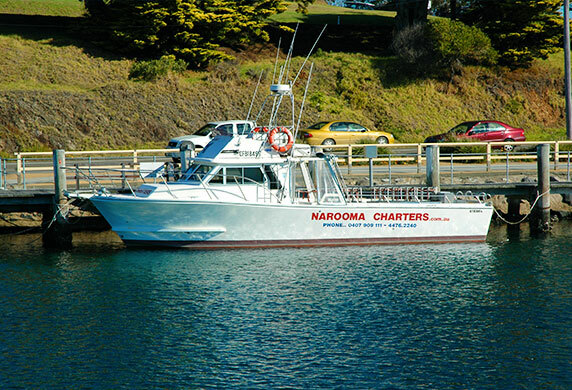 Narooma Charters. All rights Reserved.